The first World Map of Happiness has been published by scholars from the University of Leicester. 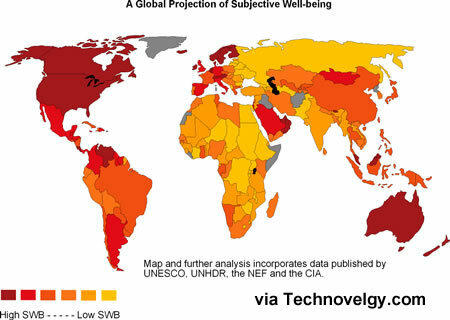 The map is a global projection of subjective well-being (SWB), taken from a variety of recent sources, and compared with related data from UNESCO, the UN and even the CIA. Adrian G. White, of the University of Leicester in the UK, points out in his study that the search for happiness is somewhat intangible, but very important. He notes that the US Declaration of Independence clearly points out "certain inalienable Rights, that among these are Life, Liberty and the Pursuit of Happiness." Philosophers like Jeremy Bentham pointed out in the eighteenth century that the purpose of politics was to bring the greatest happiness to the greatest number of people. A recent survey in the UK found that 81% of the UK population agreed that the Government's primary objective should be the creation of happiness rather than wealth. One prominent UK politician argued this past year "It’s time we admitted that there’s more to life than money, and it’s time we focused not just on GDP, but on GWB – general well-being." So how do you quantify and research subjective well-being (SWB)? It's true that temporary moods can sway a given individual's response on a particular day; however, levels of SWB can be changed by circumstances (countering the idea that SWB is biologically determined). The map is drawn with data extracted from a meta-analysis by Marks, Abdallah, Simms and Thompson, who published the Happy Planet Index in 2006. An overall satisfaction with life scale (SWLS) is extracted from their study, which calculates happiness based on life satisfaction, life expectancy and ecological footprint. That is, it reflects the average years of happy life per unit of planetary resources consumed. It is immediately evident that there is an effect of poverty on levels of SWB. The map itself mirrors other projection of poverty and GDP. This data on SWB was compared with data on access to education (UNESCO, 2005), health (United Nations, 2005), and poverty (CIA, 2006). It was found that SWB correlated most strongly with health (.7) closely followed by wealth (.6) and access to basic education (.6). This adds to the evidence that from a global perspective the biggest causes of SWB are poverty and associated variables. It turns out that people in Denmark and Switzerland have the highest overall satisfaction with life; these results were published in a recent New York Times article. The Happy Planet Index site also has a world happiness index map - remember, their index includes the impact of their material lifestyle on the environment. The link below the map takes you to their very nicely implemented interactive map. Read more about A global projection of subjective well-being and the Happy Planet Index. The Happy Planet site has a nifty survey that you can take to determine your own HPI; it takes about 5 minutes and is completely anonymous.